In this lesson, you'll learn the next Japanese conditional form - ても (temo) Sentence. By definition, it simply translates to "Even if ~" in English. ても (temo) Sentence is used to indicate a reverse condition. It's used when an action which is expected to be taken or an event which is expected to happen naturally under the given circumstances does not materialize or a thing turns out in a way opposite to a socially accepted idea. Note: We called this conditional form ても (temo) sentence because it means て-form + も (te-form + mo). However, it doesn't mean it's always ても (temo), sometimes it can be でも (demo), sometimes it can be っても (ttemo), depending on what is the て-form (te-form) in Sentence 1 of the sentence structures. Imagine you have been taking a lot of food recently. Beside the normal 3 meals, you took plenty of snacks in between meals, and ate a lot of junk foods for supper. If you continue doing this for weeks, normally it's natural that you'll put on weight. 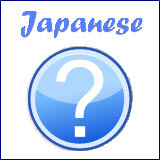 In this case, you can use the と (to) sentence to describe the situation. Meaning: If I take a lot of food, I will put on weight. However, if the opposite result happens, you should use ても (temo) sentence to describe the situation. That means you don't gain weight even if you eat a lot of food. For ても (temo) sentence, what happens is opposite to what people normally expected. Meaning: Even if I take a lot of food, I don't put on weight. Normally, when the surrounding is noisy, you won't be able to sleep easily. However, if you can sleep under such noisy environment, you can then use ても (temo) sentence to describe the situation. Meaning: Even if it's noisy, I can sleep. Meaning: If it's noisy, I cannot sleep. Meaning: Even if I sleep for only one hour, I feel energetic. Meaning: If I sleep for only one hour, I feel sleepy. Meaning: Even if it's not quiet, I can study. Meaning: If it's not quiet, I cannot study. Meaning: Even if the weather is not good, I'll do the laundry. 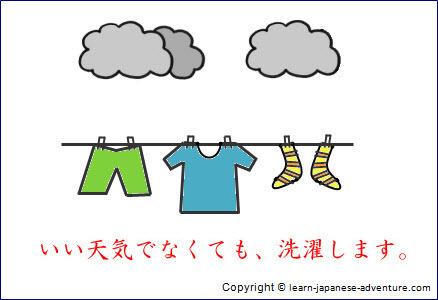 Meaning: If the weather is not good, the laundry cannot get dried. From the last example, you'll notice that the second sentence 洗濯します (sentaku shimasu) is a personal will. This is allowed in ても (temo) sentence. Meaning: Even if it rains tomorrow, I'll play soccer. The second sentence サッカーします (sakka- shimasu) - "to play soccer" is a personal will, but it's allowed in ても (temo) sentence. Meaning: Even if you have no class, please come to school. Even if there is no class, your teacher will still ask you to come to school. The second sentence in this example is a request form, but it's allowed here. For Japanese conditional form ても (temo) sentence, you use it when the opposite result happens (or opposite action is taken) to what people normally expected. And there is no regulation in Sentence 2. 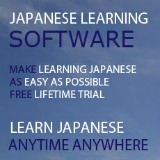 For と (to) sentence, one's will, hope, judgement, permission, order, invitation or request, etc cannot be used in Sentence 2. 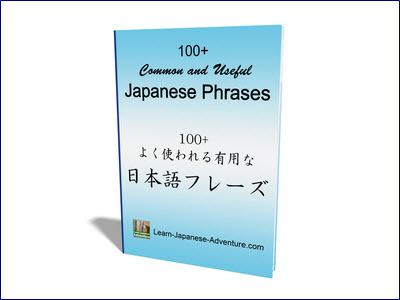 To use all these in Sentence 2, you have to use ば (ba), なら (nara) and たら (tara) sentences which you are going to learn in next few lessons.